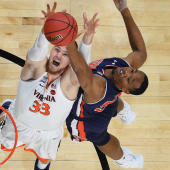 MARTIN, Tenn. (AP) Preston Parks hit the game-winning 3-pointer with more than a minute left to lift UT Martin to a 66-64 win over Jacksonville State in an Ohio Valley Conference battle on Thursday night. Jason Burnell put Jacksonville State up, 56-54 with his jumper with 5:30 left and Ty Hudson added a layup and Burnell hit from the field to push the lead to six, 60-64 with under four minutes to play. Parks hit two free throws, scored at the basket and an added a 3 that made it a one-point game, 62-61 with 2:18 left. Parks 3 with 1:23 left capped the scoring. Parks, who scored 10 of the Skyhawks' final 12 points, finished with 18 points off the bench. Quintin Dove paced UT Martin (7-15, 2-9) with 21 points. Marlon Hunter had 16 points to lead the Gamecocks (16-8, 8-3).